In the days before box sets, multiplex cinemas and a gastro-pub on every high street, what was a courting couple to do during the evenings? Without Walter White and some triple fried polenta wedges, Herbert Bellamy and his wife-to-be Charlotte Springall, had to find something else to occupy their time together in the months before their marriage in 1891. 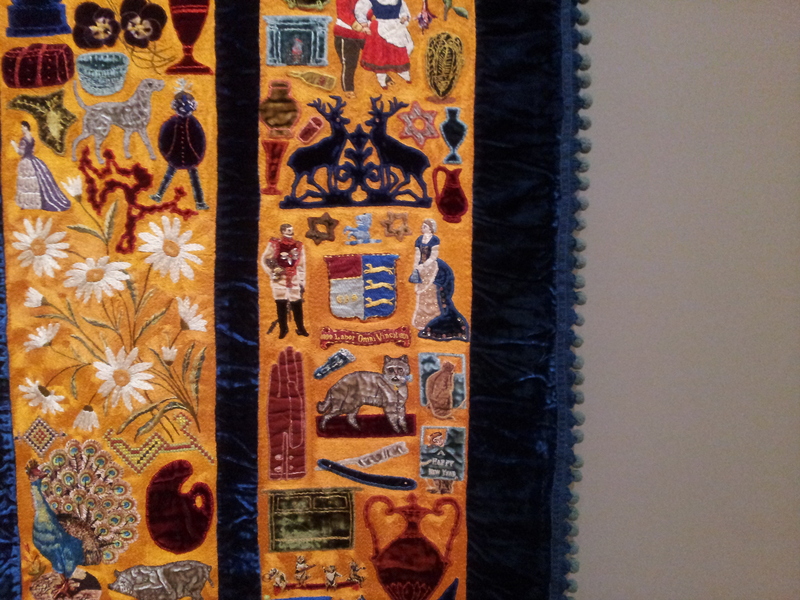 The result was a quilt, stitched in laborious, Technicolor detail to show anything and everything that was relevant or important to the happy couple: a sword, a teapot, Queen Vic with Alfred, a tabby cat, the local boozer, a Norfolk seal, the score to Auld Lang Syne, their favourite cartoon character. 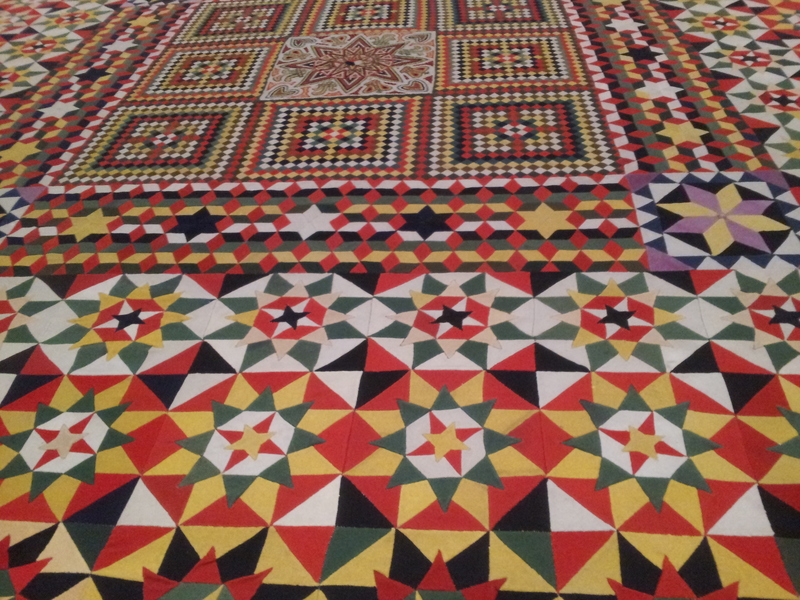 Nearly 125 years on, the quilt looks as good as new – Mrs B was unlikely to have let their painstaking work anywhere near the marital bed – and is a textile record of a relationship. 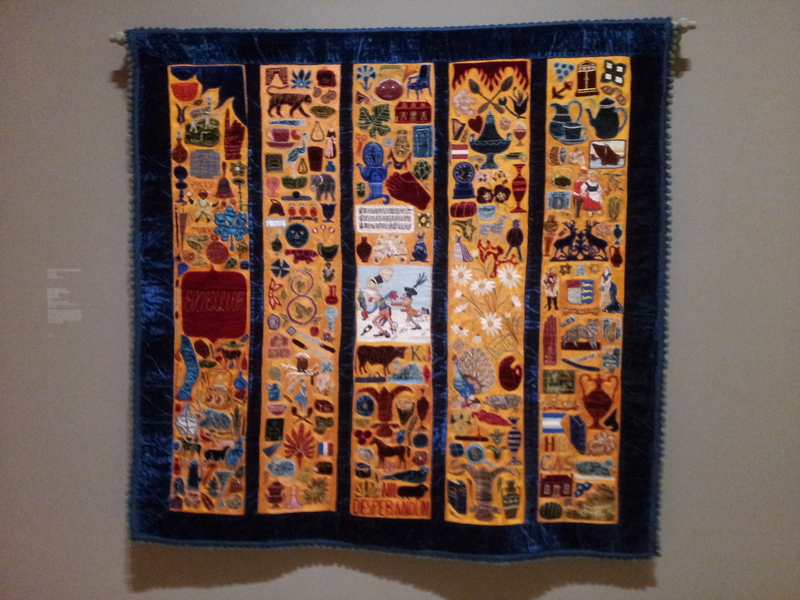 The quilt is currently hanging in Tate Britain as part of the gallery’s exhibition, British Folk Art, which showcases a wide-ranging, often bizarre, but ultimately enchanting collection of objects and pictures. 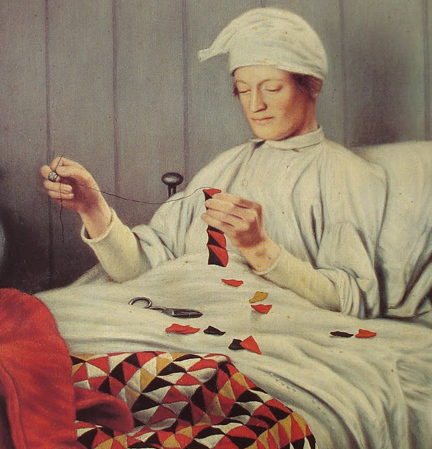 The Bellamy quilt was produced at home for the home, and although it has formed part of the textile collection at Norwich’s Carrow House since the 1970s, one cannot help but wonder whether Herbert and Charlotte would have been mystified at the thought of their bedclothes hanging in a major public exhibition. The curators of this show have not set out to define folk art, and any questions as to whether or not something is art have been deliberately sidestepped. Instead they have taken the field as it already stands; this is their starting point and this is what the viewer must accept as he enters the exhibition. 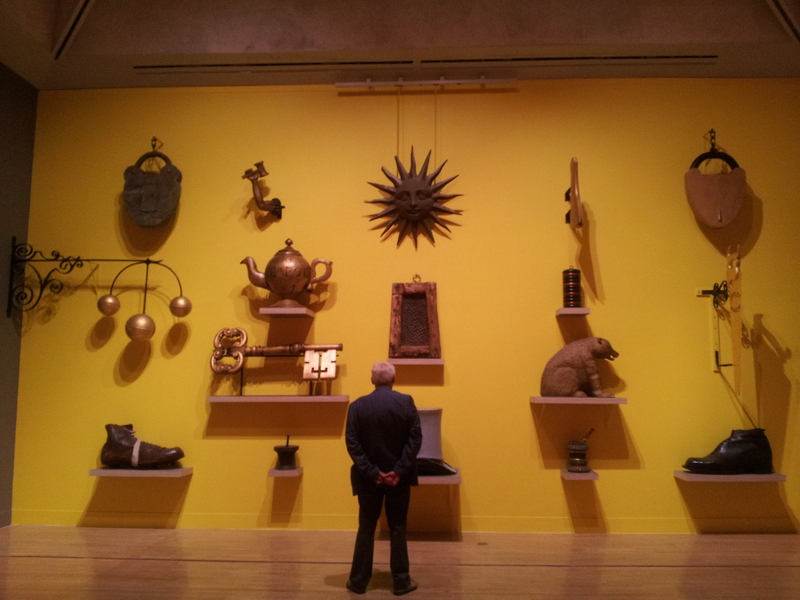 And with such thorny issues out of the way, here is a compilation of folk art’s greatest hits, a collection of some of the country’s best examples of the genre siphoned from museums and galleries around Britain. Time filling is a running theme in this exhibition, and many of the items on display were born out of a need for occupation. 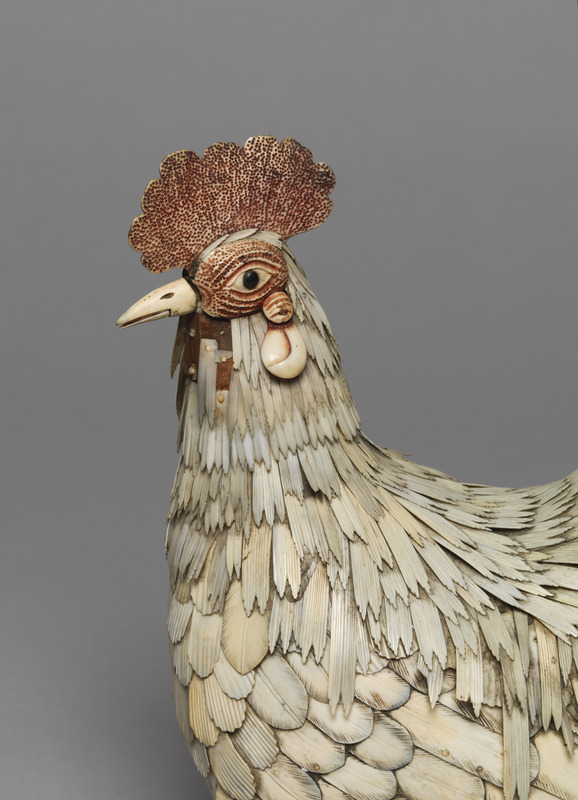 A cockerel constructed from bits of bone has been borrowed from the Peterborough Museum. 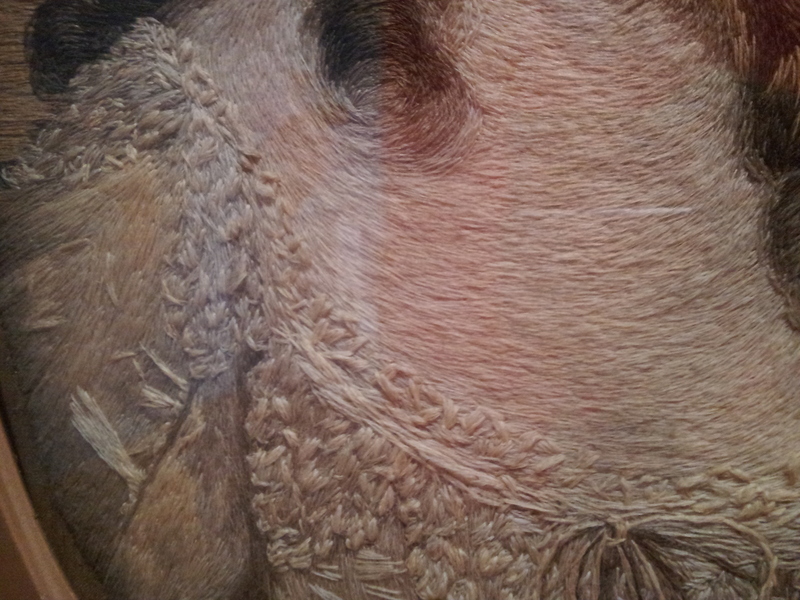 The detailing of the bird – a White Banton for those in the know – is striking. More surprising, however, is that it was made by French prisoners of the Napoleonic wars who, during their internment in a camp outside Peterborough, were encouraged to keep busy and generate some income. And so, with scraps of bone from the kitchen, using pieces of broken glass, sharpened nails and other improvised tools, this chicken, a shrine and even a violin (which may well look better than it sounds) were created. Before Kindles and Nintendo DS, sailors cooped up on long voyages amused themselves by creating “woolworks”. Artistically these cloth pictures are basic two-dimensional, crude representations. 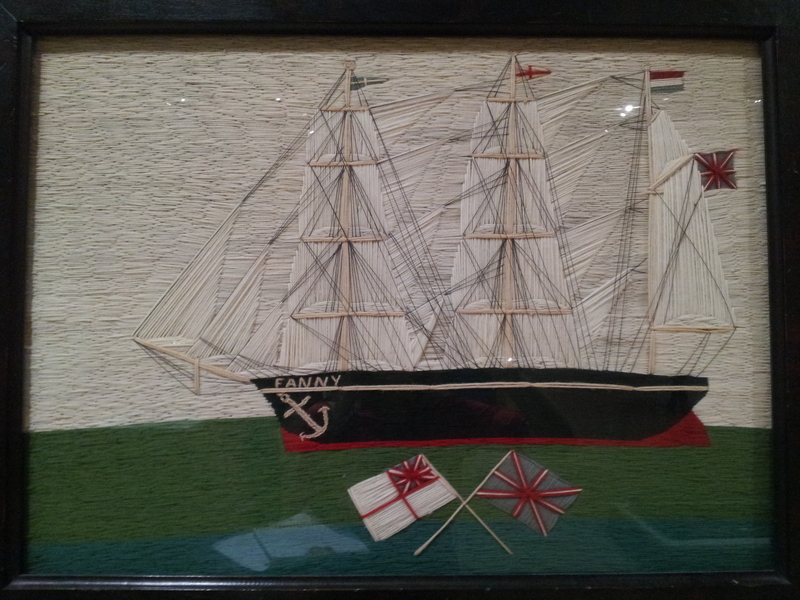 But if the sailors had not mastered perspective, years of practise fixing sails meant they were accomplished embroiderers; they also understood rigging, which in some of these scenes has been meticulously reproduced in wool. Soldiers could also wield a needle and a vast patchwork quilt created by a man suffering from the after effects of fighting in the Crimean War demonstrates this skill. Here is a nineteenth century example of post-traumatic stress therapy, some 30,000 pieces of wool fabric in various army shades of red, green, black and yellow, stitched together with military precision and the physical effort necessary to sew through thick combat material. The design is bold, repetitive, orderly and, above all, masculine – a clear contrast from the pin cushions on show in a nearby cabinet. 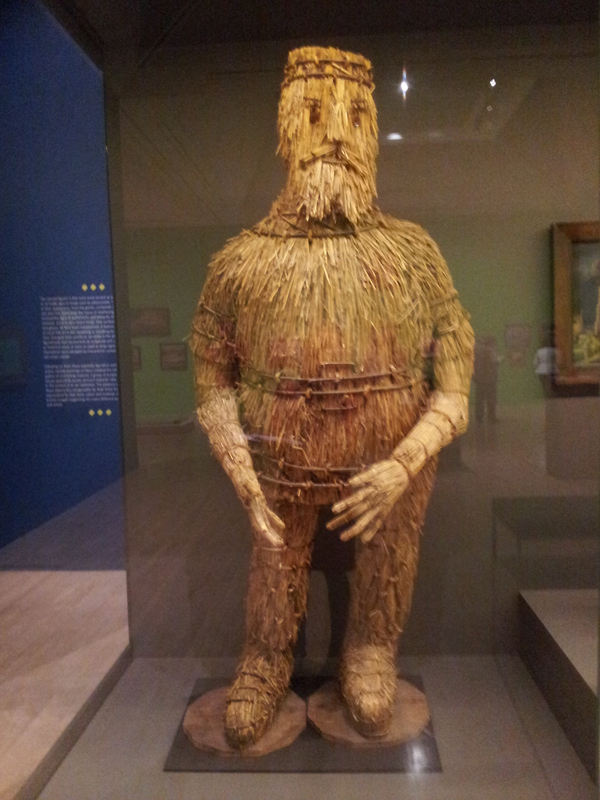 The breadth of different categories of objects included dispels any pre-conceived ideas about what constitutes folk art, and the curators have demonstrated that the genre is not solely about nostalgia and the countryside. But if a melancholy for the past is an inadequate label for this type of art, the majority of it does hail from a bygone era. The introductory wall of the exhibition is taken over by a mishmash of outsized objects: a jumbo teapot, a bear, a giant padlock, a boot. These are not, however, random models or provincial takes on sculpture, but trade signs which hung outside shops. It is easy to forget that people could not always read, and in a time before general literacy, it was these recognisable symbols that told Mr Smith where to have his shoes repaired, or Mr Jones where to get his beard trimmed. Some folk art may be small and domestic, fitting neatly on to a mantelpiece or above a hearth. But as the later rooms of this exhibition prove, artefacts can also be big. In a cabinet next to a variety of tiny objects, including a Methodist preacher whose shape has been perfectly recreated using a horse vertebrae, is a larger than life-size straw King Alfred. The figure is the show’s most recent work, and was created by a master thatcher in 1961 for a commemoration ball at University College in Oxford, which is remarkable in itself, but not half as remarkable as the fact that the straw sculpture made it to the end of the night. 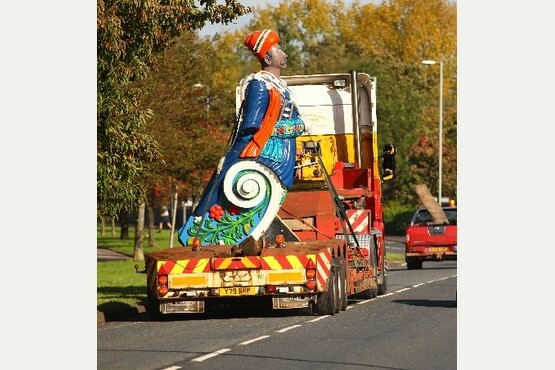 Ship figureheads are another form of oversize folk art, with one example on display measuring 15ft and which was, according to curator Martin Myrone, something of a challenge to get into the building. 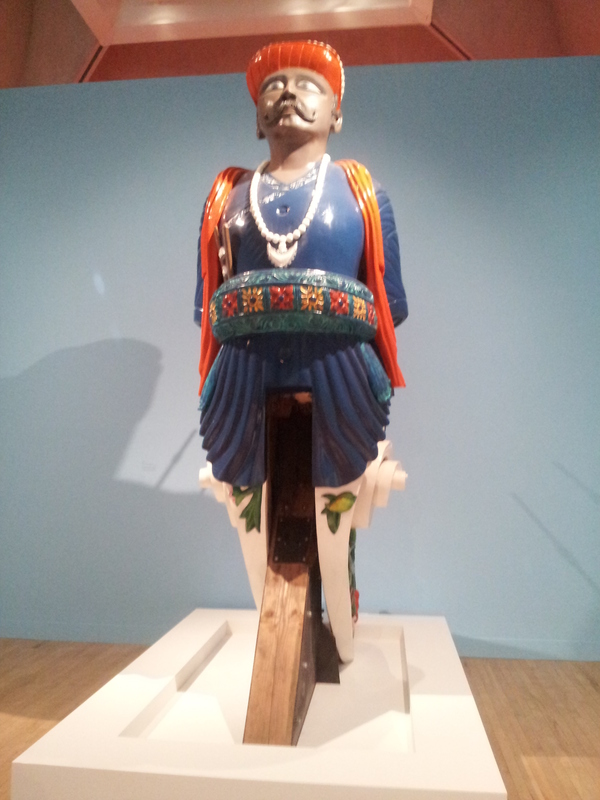 The figurehead comes from the HMS Calcutta and was made in Mumbai for the ship, which spent its sea-life travelling back and forth to India. When the vessel was broken up in 1908, the figurehead was presented to a retiring Admiral (whose wife must have been delighted), and kept in his garden until it was recently restored for the Portsmouth Royal Dockyard Historical Trust. The majority of the art on display is by unknown craftsmen. There are, however, a few examples of works by better-known artists, such as the Cornish painter Alfred Wallis (1855-1942) who was eventually taken up by the St Ives set, despite being a self-taught OAP. 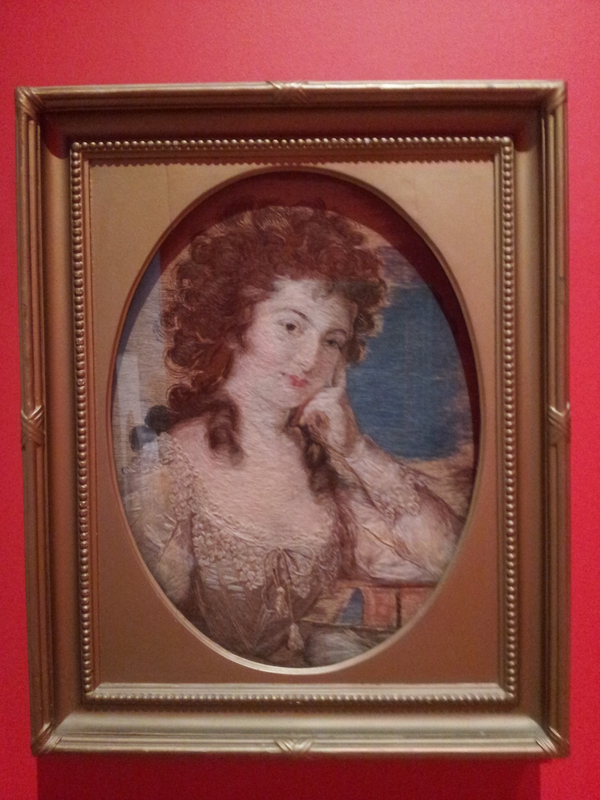 Mary Linwood (1755-1845) who created needlework reproductions of old master paintings, owned a gallery in Leicester Square, where she displayed her pictures and attracted a steady stream of tourists for several decades during the first half of the nineteenth century. 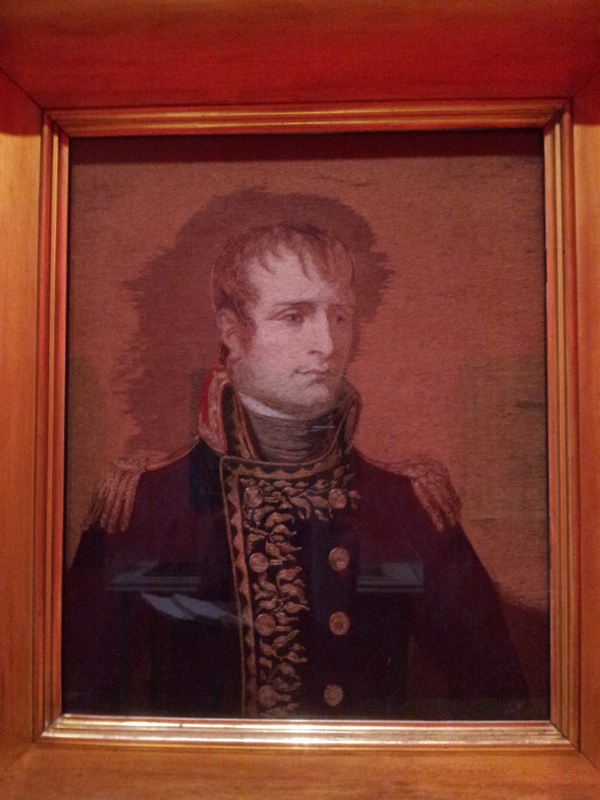 She was famous during her day – Napoleon was a fan and awarded her the Freedom of Paris in 1825 – but is less well known now, which the exhibition blurb puts down to her unclassifiable status: not original enough to be fine art, but disconnected from the domestic tradition. A more likely explanation, however, is that her stitched designs are now so deeply out of fashion. This is a display which even for folk art novices seems familiar, perhaps because the art is, as its name suggests, part of our cultural heritage. It might also be something to do with our recent fondness for the concept of “shabby chic” – distressed wood furniture and floors, painted iron light fittings, old-fashioned signs and lettering – which are sold in bijou trinket shops, and bedeck cafes across the country. For it is from folk art that this “modern nostalgic” trend has emerged, although the depressing irony is that the majority of today’s creations probably come fresh from a Chinese factory. There are many items in this show about which not much has been written, and the curators have explained that rather than producing an encyclopaedic barrel of information for visitors, they hope that the objects might speak for themselves. This is all well and good to a point, and there are some articles, such as the Bellamy quilt or the Wallis oils, which are effortlessly appealing. There are, however, many things which, without a quota of background information and explanation, mean far less. A bone chicken or symmetrical patchwork quilt, for example, become infinitely more interesting when they are placed in their historical context. This is a beautifully presented exhibition, with brightly colour coded walls and an organic feel to its installation. It is also one for which even audio guide-phobes would be well-advised to don the headphones: the field is a wide one, and even if you are an expert in quilts, how much do you really know about figureheads? 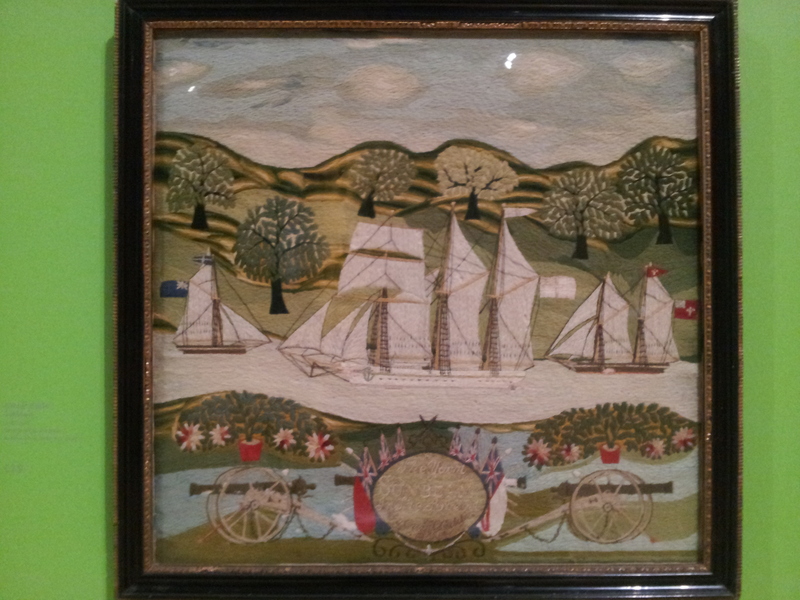 This entry was posted in Exhibition features and reviews, Reviews and tagged British Folk Art, Exhibition review, Folk Art, Tate Britain. Bookmark the permalink.